Time to get back on the bike! After an extended break which included some Spider-Man on PS4, Pokemon Let’s Go Eevee, and of course Super Smash Bros Ultimate, the moment has come to return to the backlog, this time picking up another restored classic. I’ll be riding my exercise bike while playing one of my favorite games from my childhood: Banjo-Kazooie. Banjo-Kazooie holds an incredibly special spot in my nostalgia centers as it is quite arguably the first game I ever saved up to purchase with my own money. Nintendo Power had done an excellent job of teasing and then hyping the game, convincing me I wanted it with every fiber of my being. I’d heard about Banjo-Kazooie for over a year, slaughtered Diddy Kong Racing (which gave us our first taste of Banjo), and then finally discovered that you could do something called “reserve” it at a local store, which at the time, for me at least, was pretty out there. I remember being at Target one day, trolling the electronics section like I always did, and seeing signs telling me I could reserve Banjo-Kazooie that day. Man were electronic sections so much cooler when I was a kid. Something about the way video game boxes looked back then simply trounces the clean, bland look of game cases these days. Maybe it was how little uniformity the art shared. 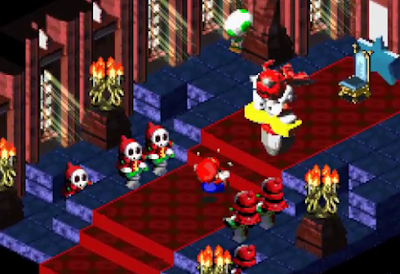 Maybe it was that the Nintendo 64 boxes had such bright damn red on them, like an alert to pay attention. Either way, electronic sections were magical. My mom had informed me that I needed to pick out a new shirt for school that day. Despite being told to look for clothing, I was browsing the video games, where I noticed that Target was selling a Banjo-Kazooie shirt in a box that came with a $10 reservation coupon in it. I was a clever negotiator even back then, so I convinced my mom to buy that shirt, thus saving me $10 off the final price of $50. I just had a few months to somehow save up $40, a herculean task as I didn’t receive an allowance. The lead-up to the game nearly killed me. I would dream about the game, and see the jar in my room with the $10 reservation coupon and a slowly growing amount of bills and coins crowding around it. When the day arrived to finally pick up my copy, I was basically floating through the air. When playing Banjo-Kazooie on Day One, I managed to smoke the first world in one sitting, something that would become a trend while playing. I wasn’t disappointed, but I was really scared that the game would be over too quickly. I’m pretty sure my speed slowed down quite a bit in the later worlds, but we’ll have to see how things progress on this go-around as it’s been probably about 10 years since my last 100% completion playthrough. Let’s begin! If you’ve never played Banjo-Kazooie, the simple explanation for the game is it’s a 3D platformer originally for the N64 that stars a bear named Banjo with a bird named Kazooie in his backpack. Banjo’s sister Tooty has been kidnapped by Gruntilda, a witch who intends to steal the little bear’s beauty for herself. 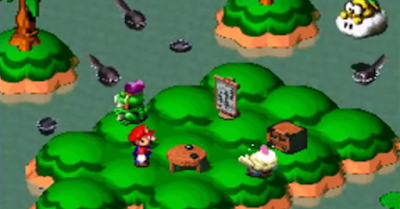 Banjo must enter Gruntilda’s lair, which contains entrances to various worlds, where he’ll be tasked with collecting Jiggies (golden puzzle pieces, 10 per world), music notes (100 per world), and Jinjos (five per world, which rewards a Jiggy upon collecting the five). It’s a game that solidified what’s commonly remembered and referred to as a “collectathon”, a term which some take as very negative, though I believe the only bad collectathon games are just bad games in general. If the game’s fun, then it’s fun, full stop. Banjo-Kazooie was fun. When the game opens, I get to re-experience the iconic intro where Banjo, Kazooie, and Mumbo Jumbo the shaman all play the main theme on various instruments. To be ultra clear, this game is corny. Really, really corny. But that’s probably why it’s endeared itself to so many people. During the 90s, every other company was trying to be edgy and cool and say, “Yo, kids! We’re hip and with it!” Banjo-Kazooie takes a decidedly different approach and says, “Yo, kids! Let’s play a video game with bears and witches and honey!” I appreciate that. After the charming intro with the game’s main theme (one that will be reintroduced momentarily in the tutorial area), I slide into the game’s menus, which are equally as charming. For save files, you select one of three scenes of Banjo and Kazooie doing various things in their house, either sleeping, cooking, or playing a Game Boy. I always went with the Game Boy scene, part because I love me some Game Boy, and part that I have a tendency to always select save file 3 on any game, perhaps as a way to mitigate the chance of my sister accidentally erasing the first save file. Yes, that happened to me. On multiple occasions, first with Super Mario 64 and then again with Diddy Kong Racing. Banjo-Kazooie was thankfully safe from her nefarious deeds. I can’t tell you how delighted I was getting to hear Gruntilda start the game off again after all these years. In what’s become a signature for Rare, every character in the game speaks in a gibberish sound bite, so Banjo has a sort of “duh duh-duh” voice while Kazooie has a “gwa wah wah” voice and Gruntilda has a “gyeh nyeh neh” accent. Huh, trying to phonetically write out Banjo-Kazooie dialects is a different sort of challenge than I expected. Try it for yourself! Give me your best character accents! The opening sets the stage for things to come as Gruntilda checks her magic cauldron, named Dingpot, and learns that she’s not as pretty as Tooty, Banjo’s kid sister. Grunty flies off on her broom to kidnap Tooty, which prompts Banjo to finally wake up and head outside to see what’s going on. This is where we meet Bottles, a mole that teaches you all the moves and concepts from the game. The dynamic between him and Kazooie is great since she cuts him down and keeps asking for him to teach her how to fly, whereas Bottles is pretty dismissive and a little annoyed with her attitude. Cute characterizations for a corny sort of game. I make it a habit of allowing games to run me through their tutorials, no matter how obvious. Reason for this is my time as a Localization Writer/Editor where I had to do a lot of context-checking playthroughs of games, meaning I’d do my best to see every cell of text I could. As a result of that, and because I understand the effort required to write game text, I make every attempt to see all text in whatever game I play through. Call it a professional courtesy. Therefore, despite playing this game at least half a dozen times in the past, I’m once again letting Bottles teach me each move individually. You’ve got your standard moves, as expected. One button jumps, another attacks. You can jump again in the air, or perform a mid-air attack. You can do a higher jump from a crouch, or a stronger forward attack. You can climb trees and swim and that’s essentially everything to start with. In short, the tutorial teaches you that you can do most of the basic moves present in Mario 64 (no ground pound yet, but soon). Mostly what I wanted to do was acclimate myself to the Xbox One controller since I’m playing this through Rare Replay rather than on the original N64 or an N64 Classic, which we know will be announced AFTER the holiday is really truly over (mark it on the calendar and call me a prophet later). Thankfully, the controls feel pretty natural, though I’m fighting the camera more than I expected, just because we’re living in a world where camera controls are a simple and intuitive part of games. We’ve come a long way and fought a great many battles to get to a world where kids don’t even know that older 3D titles had awful camera controls. I salute you, fellow N64/PS1 era gamers. Finishing Spiral Mountain’s tutorial section leads me into Gruntilda’s lair and the first extended introduction to her theme, which you’ll hear more than any other theme in the game. What’s so amazing about Gruntilda’s theme is that it’s a dynamic theme, meaning while in her lair it is ever present and ever changing depending on the surrounding area. It’ll stay regular in neutral cave-like areas, then shift to a more sea-shanty style when by the ocean world, or get all Christmasy near the snow world. It’s some master work from Grant Kirkhope. Grunty’s lair introduces us to the structure of the game where you’ll need to find golden puzzle pieces, put them in a world’s mural, and then enter the world. The first Jiggy is hanging out in the open at the top of a simple jumping test, allowing you access to the first world, Mumbo’s Mountain. I’d forgotten just how small this first world is. It’s no wonder I ripped through it so quick as a kid! I’m guessing I spent less than 20 minutes getting everything in the world since it’s very straight forward, which makes sense for a starter world. The layout is simple, with roughly one main path that takes you up a small hill, past an orange-throwing gorilla named Conga, around a termite mound, and finally into a small village of tiny huts with Mumbo’s Skull (what the game calls his house, though it makes sense as it does look like a big skull hut). You learn three new moves in this world from Bottles, all being essential for the rest of the game. The first is the Beak Buster, or the classic ground pound stomping move you’d expect to see in a 3D platformer. This is used to smash the huts in the village to get a Jiggy, some music notes, and a Jinjo. The second move is the ability to fire eggs, either straight forward as an attack from Kazooie’s mouth or pooped backward from her rear. The forward firing is used to defeat Conga in a very simple boss battle as well as appease a totem tower in the village. The last new move from Mumbo’s Mountain is arguably the most utilized move in the game: the Talon Trot. It’s incredibly simple, just allowing Kazooie to carry Banjo around on her back, which lets you scale steeper inclines without slipping. However, this also increases your movement speed considerably and will instantly become your default traversal method throughout the game since Banjo’s lumbering stride is too lackadaisical for anyone to use. Now that I’m literally running through the world, I’m able to conclude it quick with a stop in Mumbo’s hut to get turned into a termite and grab the 10th Jiggy for the stage. That makes all 10 Jiggies, all 100 music notes, and two honeycomb containers used to increase my health whenever I collect six. Lastly, every world has a thing call a Witch Switch which when stomped will do something in Gruntilda’s lair, usually spawning a Jiggy somewhere nearby. The first Witch Switch puts a Jiggy on top of the world’s entrance, which I’m able to nab as a termite when I exit the world. In terms of transformations, the termite is very simple, only giving me the added ability to walk on even steeper inclines and I guess breathe underwater, though the latter ability is not used at all while the former ability is used to access one Jiggy in the world. Transformations are only ever used in the one world your get the transformation, and then just outside the world in Gruntilda’s lair. Beyond that you revert to bear and bird. Next time, I move deeper into Gruntilda’s lair and enter the second world, Treasure Trove Cove. See you there!